Carbon is a word that gets a lot of attention these days as a trendy term," says Papworth. "But really when it comes to day-to-day farm field operations it has exceptional relevance as a key measure for farm management. If your carbon use is higher than it should be or could be, bottom line is you're losing money you don't have to lose. Are you getting the most you can out of your farm machinery? One of the most important things producers need to know in order to answer this question is how much energy they are using. Until now, that's been a tough figure to pinpoint. But Alberta Agriculture and Rural Development (ARD), along with Climate Change Central, has developed a new "carbon footprint calculator," based on heaps of the best quality farm data available, that is designed by agricultural engineers to do just that. Best of all, says Lawrence Papworth of the ARD AgTech Centre in Lethbridge, Alta., the calculator is tied to a step-by-step program producers can use to not only understand their energy efficiency but ramp it up substantially. "Carbon is a word that gets a lot of attention these days as a trendy term," says Papworth. "But really when it comes to day-to-day farm field operations it has exceptional relevance as a key measure for farm management. If your carbon use is higher than it should be or could be, bottom line is you're losing money you don't have to lose. The calculator is designed as a tool farmers can use to see where they're at. If they're high, they can plug into a program to pinpoint the issue and fix it." The calculator effort is the latest component of an energy assessment program that started as a pilot program for dairy, swine and poultry facilities. The results of the assessments give producers information on how their operation uses energy and ways to save energy. The assessment program also verifies energy savings on each farm. The success of that initial phase lead to expansion plans toward a "whole farm" effort, with a key piece to that puzzle identified as having a way to measure energy at the field operations level. The carbon calculator was designed to fill that gap. It represents a first-of-its kind effort in Canada. It will help producers identify and reduce their energy use. It can help industry do the same thing at a broader level, tying in with the trend today to measure and reduce greenhouse gas emissions. At a basic level, the calculator is designed as a straightforward informational and diagnostic tool, says Papworth. "There are a lot of things you can do with it. For the producer looking to understand energy use and keep as efficient as they can, this is really a tool that is very hands-on and very practical." Use of the calculator is simple, step-by-step and done on a field basis, he says. "You input your information for a field, then it figures out the energy you are using. If that level is high, you can then take a closer look and find out where the issue is." The backing of the energy assessment program makes the calculator an improvement-oriented tool, says Papworth. The computer program that runs the calculator includes a wealth of built-in information that comes up on its own as producers follow prompts. This includes tips on potential issues and how to address them. The energy program also provides access to knowledgeable people who can work with the producer through on-farm visits or by phone. "Producer value is really the focus," says Papworth. "We want to help producers pinpoint where the inefficiencies are and help them find solutions. We're using the calculator and all the information the calculator program contains, along with quality human expertise and judgment. Both components use the best knowledge we have available." Currently, Papworth and colleagues are setting up plans to test run the calculator as part of the energy assessment program with a limited number of producers. "That will help identify any bugs or any little things we can tweak to improve," says Papworth. "After that, we will get plans in motion to make the tool widely available." The calculator effort and energy assessment program are part of a bigger trend where a broad swath of industry is targeting ways to get a better handle on energy use in agriculture and find ways to maximize energy efficiency, both from the perspectives of individual producers and the industry as a whole. "We're really looking forward to building the base of information on just what is happening out there, as a basis for benchmarks and comparisons," says Papworth. "When we get it launched, we'll start building information on different types of fields and different types of areas. That will give farmers a gauge of where they sit compared to producers in similar situations, including with specific crops. And at and industry level that information can really help programs that need to better measure energy use - including specific aspects such as greenhouse gas emissions - and set targets for improvements. "We believe this effort will go a long way to giving farmers and industry those baselines they need to really make progress." What does Papworth expect when the producer information starts rolling in? "I'm sure there'll be a group of farmers who are fairly efficient, there'll be an average and some that aren't. But the big thing we can count on is we will have a much better basis to make improvements once we have that information." The calculator is fundamentally a sophisticated tool that gets farmers to hone in on some simple but very important questions, he says. "What we're hoping is a producer can say 'well I'm not very efficient, what should I look at?' They can take a look at their tractor, and say 'well do I have it ballasted properly? Are the tires on it pressure correct? Am I getting the most out of my power usage?' Those are typically the major things. But we also hope they get into a level of management where they say 'okay what if I eliminate that tillage operation? What would that do?'" The pressure is coming to have more of that mindset all the time, says Papworth. "I think in general producers are pretty efficient with their fuel use, but as the price of fuel goes up and there's more scrutiny of emissions on all fronts, the bottom line is they have to become more efficient." Filling the knowledge gap on how farmers are using energy is a major piece of the puzzle to enabling quick improvements. Developing the carbon calculator was a long, detailed process, says Lawrence Papworth of the Alberta Agriculture and Rural Development (ARD) AgTech Centre. "One of the big gaps in the energy area is looking at field operations, and there are a lot of variables that come with doing that. It's fairly easy to look at a livestock barn because its basically natural gas and electricity use in it, but when you start getting into field operations and fuel it's a lot more complex." But within that complexity, Papworth and colleagues saw lots of opportunity. "We did want to develop something for crop farmers because they do spend a lot of money on energy – it's always close to the top among the major inputs. So we kicked around a bunch of ideas and we thought a calculator that looks at this area could really provide a lot of value. One of the first things we did was look around to see if there were any calculators out there. There were some, but they weren't to the detail that we wanted them to be. So we set out to develop a calculator that had the detail in it." In addition to the field specific information on energy use, the calculator includes a number of related components that help ensure equipment is looked after and used most effectively. Tire pressure. 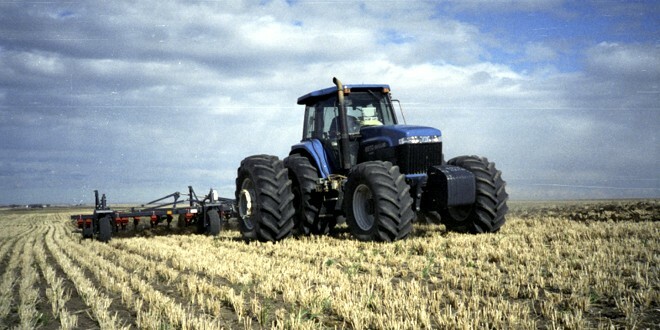 Among the examples, the calculator uses Nebraska Tractor Test data as a basis to provide recommendations for a number of factors related to tractors and related equipment. "You can use that to figure out what your pressure should be in your tires," says Papworth. "You can also use it to balance your tractor – depending on what weight you're pulling it will tell you how much weight you should have on your tractor. That's a nice feature." Balance and equipment matching. The calculator also provides suggestions on setting up optimal matches of specific types of equipment. "If your tractor is oversized, it'll suggest you look at gearing up," says Papworth. "It will suggest the opposite if your tractor doesn't have enough power and as a result is not a good match for the traction equipment." Running scenarios to see how much is too much. One of the most eye-opening and helpful features, says Papworth, is the ability of the calculator to run scenarios showing the advantages of eliminating specific types of operations. "It gives the producer a new way to look at energy management," says Papworth. "After a while, they will start to think that way – 'how much would I have saved if I had eliminated that operation on that field' and the calculator will figure that out. For example, 'what if I didn't cultivate' or what if I did two fewer operations on that field.' The calculator will encourage more efficient management."